US lawmakers announced an agreement in principle between Democrats and Republicans to avoid a new shutdown, while Donald Trump extolled the merits of his wall in a speech in El Paso, a city on the Mexican border. The compromise, announced on Monday night to prevent a further partial shutdown of the federal administration in a few days, provides $ 1.3 billion, including for the construction of some 90 km of new border barriers, far from the initial demands of the White House. It will still have to be voted by Congress and approved by the presidency. "We have reached an agreement," said one of the top Republican negotiators, Senator Richard Shelby, quoted by CNN after the negotiation meeting. Weakened by the House's loss in November and its retreat in late January in the fight with Democrats over immigration, Donald Trump still requires the release of about $ 5 billion to build the controversial wall. 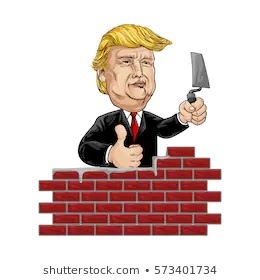 This move to combat illegal immigration from South America is a campaign promise by the American president, who insisted Monday night in El Paso that the walls help "save lives." "We need a wall ... and we will build it quickly," he said. Trump remained elusive about a possible exit from the impasse in Congress. "They said there was progress ... There may be good news, but who knows?" After a 35-day stalemate, a record in US history, Donald Trump finally relented in late January, signing a budget bill to pay the salaries of some 800,000 federal employees. But the truce was only temporary, and the new deadline, set for February 15, is approaching. Several weeks ago, the White House has threatened to resort to an exceptional emergency procedure to release the necessary funds without going through Congress. A 1976 law, the National Emergencies Act, authorizes the president of the United States to invoke a national "urgency" to activate extraordinary powers. Realizing that such an initiative, which is not unanimous in his field, could trigger a fierce political-legal battle, Donald Trump has avoided taking that step. With his eye on the 2020 presidential election, where he plans to seek a second term, the president pinned Beto O'Rourke, a rising star of the Democrat party attending a rally not far off. The 40-year-old man, who promised to rule on possible presidential ambitions by the end of February, called the rally to respond to "lies and hatred of the truth and an ambitious and positive vision of the future." Donald Trump, on the other hand, mocked this "young man who lost a (senatorial) election against Ted Cruz". The demonstration, organized by several NGOs, aimed to denounce "Trump's obsession with the border wall and the deforming prism with which he describes life in El Paso." Last week, during his annual address to Congress, the White House tenant cited the city as an example. But these arguments did not please everyone. "The city has an extremely high rate of violent crime and was considered one of the most dangerous cities in the country," he said. "Once a powerful barrier has been established, El Paso has become one of the safest cities in the country." This description of this Texan city located more than 3,000 kilometers from Washington does not, however, resist the analysis of numbers. The construction of a barrier occurred in 2008/2009. But over the last 30 years, crime has peaked in the mid-1990s, with a one-third drop in violent crime between 1993 and 2006. "El Paso is one of the most secure communities in the United States and long before the wall was built," said Democrat Veronica Escobar, who believes the president of the United States should apologize to its residents. "This misinformation is causing damage," she added. Throughout his speech in El Paso, Donald Trump once again stepped up attacks on journalists. "The so-called fact-checkers are among the most dishonest people in the media," he said in front of a crowd of "Make America Great Again.